NEARLY 18 houses in Kalkfeld that are being constructed under the auspices of the Shack Dwellers Federation of Namibia are nearly completed. 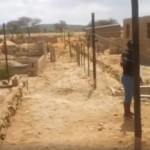 Otjiwarongo Constituency Councillor, Julius Neumbo has noted that the community of Kalkfeld is helping to fast track the project and that soon the newly built houses will be donated to members of the community who have registered under the federation. Neumbo urged more residents of Kalkfeld to join the federation and in order for them to benefit from the initiative, explaining that the only requirements for signing up is a payment of N$800 and active participation in the weekly meetings of the SDFN. Active members will eventually be able to take ownership of a one-bedroom house, each with a bathroom and open plan kitchen, for less than N$33 000 in the Ondundu-yo-vitenda settlement area. “We are happy with the speed at which we are moving. It is taking us less than seven days to build a house, starting from the foundation, said Neumbo. The project started when the federation received un-serviced land from the Otjozondjupa Regional Council free of charge in 2016 and ever since have been working hard to develop and ready the area for houses to be built. Most of the servicing of land work is done by local members of the SDFN with the necessary experience and skills.